Victorian London: For five years, Charlotte (Charlie) Holloway has lived as a boy in the slums. But when one theft too many gets her arrested, her only means of escape lies with a dead man. Charlie hasn’t raised a spirit since she first discovered she could do so five years ago. That time, her father banished her. This time, she brings even more trouble upon herself. People are now hunting Charlie all over London, but only one man succeeds in capturing her. Lincoln Fitzroy is the mysterious head of a secret organization on the trail of a madman who needs a necromancer to control his newly “made” creatures. There was only one known necromancer in the world – Charlotte – but now there appears to be two. Lincoln captures the willful Charlie in the hopes the boy will lead him to Charlotte. But what happens when he discovers the boy is in fact the young woman he’s been searching for all along? And will she agree to work for the man who held her against her will, and for an organization she doesn’t trust? Because Lincoln and his ministry might be just as dangerous as the madman they’re hunting. So… confession time. Instead of writing this review immediately upon finishing The Last Necromancer, I may have picked up the second book right away and devoured it as quickly as I did the first one. And let me just say that November and book #3 both seem very, tragically far away at this moment. So, Dear Reader, does that give you any indication of my thoughts on this book? So why did I enjoy it so much? Well, while the main plot of this novel — Charlie’s necromancy being actively sought after by rival parties for reasons possibly nefarious, as well as the mysteries surrounding the intentions and backgrounds of each party — is well done and compelling in it’s own right, the real strength of this novel lies in Charlie herself. Archer does a fantastic job of bringing her heroine to life — Charlie is relatable, empathetic, flawed and utterly wonderful. Having lived on the streets for five years has changed her from the dutiful vicar’s daughter into a street-smart, wise-cracking survivalist. She’s known pain, hardship, loss and these things have shaped her and molded her into a young woman who is clever, determined, resourceful and not easily cowed. Which is fantastic especially when she’s pitted against an antagonistic force like Lincoln, the formidable and intimidating head of the Ministry of Curiosities. Her progression throughout this first book — her struggles to understand herself and her place in the world — is just satisfying and very well done. Speaking of Lincoln, he’s another reason this book was such a page-turner. He’s enigmatic, reserved, secretive — a man of few words and even fewer emotional tells. He could’ve been a very boring, flat character. And yet, somehow he isn’t. He is fascinating in his subtleties, and Archer did a good job giving him just enough dimension while still maintaining his overall aloof mysteriousness. Since both Charlie & Lincoln made such an impression, I guess it will come as little surprise that I also greatly enjoyed the camaraderie that’s building between them. But there’s also a really fun antagonistic push and pull that goes on here as well. It’s a slow-building, frustrating, intense kind of something… and I’m totally loving it. And it’s part of the reason that November cannot get here soon enough. Other things I love include Seth, Gus & Cook. The Ministry of Curiousites committee members are a very interesting and polarizing group of folks as well, which lays groundwork for some potentially interesting political situations. Really all the secondary and supporting characters are great. The descriptions of London are dark, evocative, and unsettling; London is essentially just another character that Archer brings to life. Things that didn’t do it for me include the “literary” twist. The story would’ve been just as good without it. Also, while the existence of the Ministry of Curiosities is an interesting and vital bit of the story, I wish there was a bit more explanation as to its current, somewhat bare bones state if it’s an organization of such importance. And connected to that, a little more definition to the supernatural world as a whole would be great. But these things may come with future stories. Overall, The Last Necromancer is a captivating, character-driven gaslight mystery, and I’m eagerly anticipating Charlie & Lincoln’s next adventure. C.J. Archer has loved history and books for as long as she can remember and feels fortunate that she found a way to combine the two with her writing. Under her other name of Carolyn Scott, she has published contemporary short stories in women’s magazines, and she also writes romantic mystery novels under this name. She has at various times worked as a librarian, IT support person and technical writer but in her heart has always been a fiction writer. 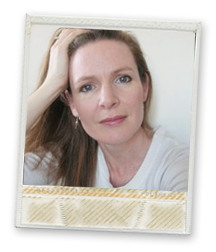 She has won and placed in romance writing contests including winning RWAustralia’s Emerald Award in 2008 for the manuscript that went on to be released under the title HONOR BOUND. C.J. spent her early childhood in the dramatic beauty of outback Queensland, Australia, but now lives in suburban Melbourne with her husband and two children. To be notified when C.J. releases a new book, subscribe to her newsletter from her website. She only sends out the newsletter when she releases a new book, and never spams. C.J. 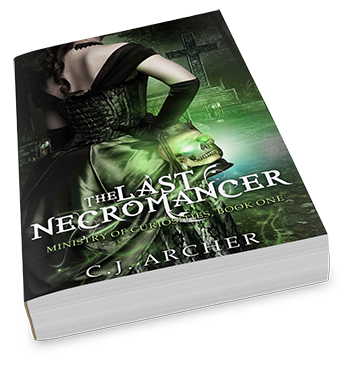 is giving away ONE (1) ebook (INTL) or ONE (1) paperback (US/CAN) of THE LAST NECROMANCER to ONE (1) lucky winner. Terms and conditions arelisted in the Rafflecopter form below. Entrants must complete the Rafflecopter requirements to be eligible. Thanks for the awesome review! Glad you liked it. Thanks for such a fun read! Im in love with this series!! Keep em coming CJ Archer! 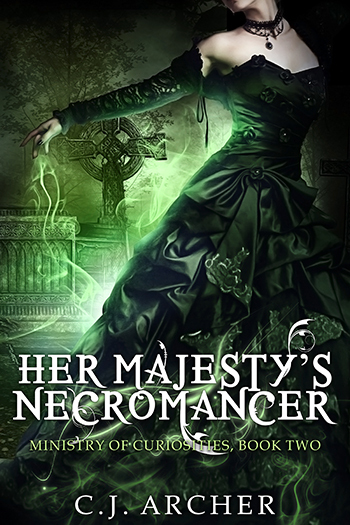 Have you read Her Majesty’s Necromancer yet? So good. Thanks for the review, I’ll definitely be adding this book to my tbr list. I would not want to be a necromancer though, too much pressure. This book seems really interesting though I’m not sure about being a necromancer, don’t want to accidentally bring back some bad guys. Can’t wait to read it! It would be very interesting to be a necromancer, but could be trouble too. I would definitely NOT want the gift of necromancy! Too scary! Sounds like a fun read. Thanks for the giveaway. I think the power of necromancy is very alluring. Maybe too much. I could get in a lot of trouble raising the dead and having them do my bidding. On the other hand, I could probably hand over nearly all house chores to the walking dead….. I would NOT like the gift of necromancy – too creepy – , but the book sounds like a great read! I am good just reading about necromancy. I don’t think I would want to have it. Thanks for the giveaway – I have added this to my reading pile. I am always up for reading about necromancer’s!